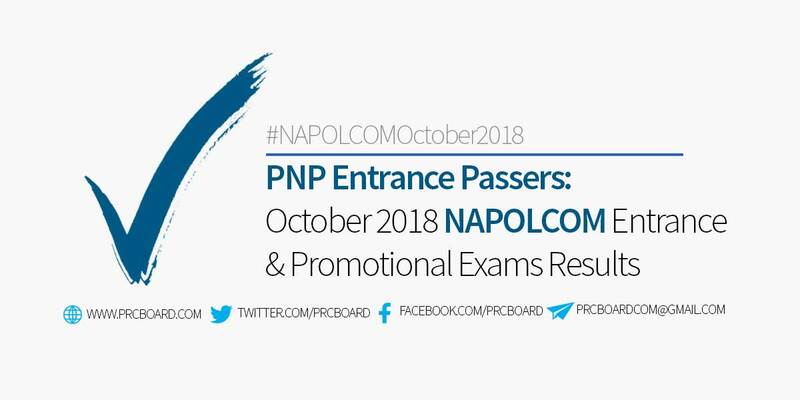 MANILA, Philippines - The October 2018 NAPOLCOM exam results and list of passers for PNP Entrance exams are available at this website as the National Police Commission officially released the results online three (3) months after the date of examination. Below is the complete list of passers for October 2018 Philippine National Police (PNP) Entrance Exams, courtesy of NAPOLCOM. 18-10-0408770, ALANO, MICHAEL LAURENCE . 18-10-0308461, AVENDAÑO, MA. FRELIE JOY NMN. 18-10-0509091, BLASA, SARAH MAE . 18-10-0308971, DACILLO, MONICA ANGELA . 18-10-0608838, DUCA, KAREN MARIE . 18-10-0208433, FLORES, DEZZA JANE . 18-10-1108848, FUERZAS, JESSIE JOHN . 18-10-0509621, GARCIA, LOUIE JAY . 18-10-1308979, GOMEZ, BLU ALIZON . 18-10-4307887, JOSOL, JERIC WILLIAM . 18-10-2008035, KAIBIGAN, JAY WILHELM ZEUS LOURD . 18-10-1308782, LAGUICAO, MARY RUTH . 18-10-1008965, PAGULAYAN, JOY AGNES BUNAGAN. 18-10-0208235, PARAYO, ROSELLE KAITH . 18-10-0108876, PASION, PHILIP JOSHUA . 18-10-0509773, RAMOS, ISAAC FREDERICK . 18-10-0408941, TORRES, JEREMY ANGELO . The entrance and promotional examinations are administered by NAPOLCOM on October 21, 2018 at testing locations in Makati City, San Fernando (La Union), Tuguegarao, Angeles (Pampanga), Cabuyao, Imus, Baguio, Calapan, Legazpi, Iloilo, Cebu, Tacloban, Calbayog, Pagadian, Zamboanga, Cagayan de Oro, Davao, Mati (Davao), Koronadal, Butuan, Cotabato, and in the province of Tawi-Tawi (ARMM). Atty. Rogelio T. Casurao, the Vice Chairman and Executive Officer of NAPOLCOM, said that these exams aim to promote and recruit more law enforcers in order to enhance police visibility around the country as well as strengthen the insurgency operation of PNP. As discussed in the main article, the results are expected to be released by December 2018 to January 2019 or in 2-3 months after the exams. We advise our readers to visit NAPOLCOM official website, bookmark this page, follow us at our social media pages via Facebook and Twitter or join the members discussions at our Facebook Group to receive constant updates. How to see the ratings for this exam? How can We get the I.D. or any certificates to know that we passed the exam?